In a world where people see thousands of messages at once – via Facebook, email, online ads, texts, and other outlets – it can be challenging to really grab their attention. It’s even more challenging to keep their attention. That’s why it’s so incredibly important to craft a solid, captivating message. The first and foremost thing when it comes to creating engaging Facebook videos is exactly that: be engaging. We don’t have much time to capture anyone’s attention these days. You have, on average, about 2-3 seconds to engage someone. When it comes to creating Facebook videos (and videos, in general) you don’t want to create a long, drawn-out introduction that steadily builds up to some masterful climax that shocks and awes a visitor. Your video must get to the point. You must be able to accomplish this using only compelling visuals – not video coupled with sound. Add a nice teaser sentence hinting at what the video is about. There is no definitive proof on how many users watch videos on Facebook with the sound on (though this number is estimated to be 85 percent), although Facebook now autoplays videos on mobile with sound. The setting can be disabled, and videos can play with no sound on mobile if a user’s phone is in silent mode. Captions can help users understand your video, even if there is no audio. This helps to decrease the chance of losing the user if they can’t understand the video without sound. Make sure your video has a descriptive, captivating title so that it can be easily searched by users. 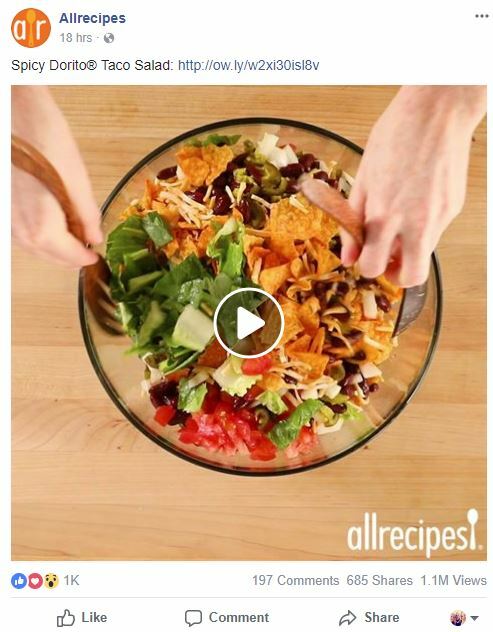 Just like optimizing individual webpages (your title tags and meta descriptions), you Facebook video should include an apt title with targeted keywords to increase its visibility. Use your Facebook post copy to describe the content of your video. This will help convince users to commit to watching the video. Taking the time to stop and view a video online can seem like a large time commitment for some. By providing Facebook users with a brief synopsis on what the content is about, you can help to increase the chances that the video may spark their interest and that they will want to watch it. An informative sentence and a fitting thumbnail can easily achieve this. Adding a call-to-action (CTA) provides Facebook users with clear direction on what you want them to do. CTAs can encourage higher click-through-rates (CTRs), conversions, and more. Inside of the post copy. At the end of the video with a text overlay. When formatting your Facebook videos, pay close attention to whether you utilize a square video or a landscape video. Square videos receive higher amounts of engagement, views, and reach – particularly on mobile. This makes sense, as the majority of Facebook users use their mobile device and square videos take up the majority of real estate on the mobile News Feed. This classic point can be applied to many things, including encouraging engagement with your Facebook videos. Don’t try to throw too much at users at once with a Facebook video. If you want to increase the likelihood of a video being consumed and then shared, it needs to emphasize one simple, easy-to-understand point. Making your content easy to digest and understand will increase the chances that users will actually share your videos. If other people or businesses/brands helped with (or appear in or are mentioned in) your Facebook video, or if you think that others would be interested in seeing it, then it could be a good idea to tag them. Just make sure to keep tagging relevant and on topic. Type the “@” symbol before the person or title of the page that you wish to tag. Facebook provides insights such as average watch time, total minutes watched, etc. This can provide valuable intel into which videos users find the most engaging, as well as help in planning out future social video strategy. Learn more: How to Use Facebook Page Insights Like an Expert. Adding videos directly to Facebook helps them to rank in a more prominent position in the News Feed. If you have a YouTube video that you would also like to share on Facebook, avoid copying and pasting the YouTube link and instead post the video again directly to Facebook. You probably have a presence on multiple social media platforms. But it’s a smart idea to create individual copy tailored specifically for Facebook. This way, it is easier to avoid sounding automated and generic across channels and it also allows you to play to each channel’s strengths. For example, with Facebook, there is a much longer character limit (63,206) per post. When necessary, you can you use this to deliver longer messages that will likely get more engagement. Comments also have a character limit of 8,000, which invites users to write more drawn out messages on individual posts. Facebook’s algorithm has been updated in order to favor live videos as data has shown that live videos typically hold a user’s interest for a longer period of time. Live videos have also been known to cause a bump in users exploring that page’s content (even if it isn’t the live video itself). The hypothesis is that brands who get in front of their audience in this very direct away can help increase their level of relatability and trust. In addition, Facebook will record the live video and publish it directly to a page once the recording session has come to an end. In a world where you less than 3 seconds to grab a user’s attention, it’s important to spend some time strategizing on the best ways to do so. Facebook is an incredibly powerful outlet. Use your Facebook videos strategically to take full advantage. 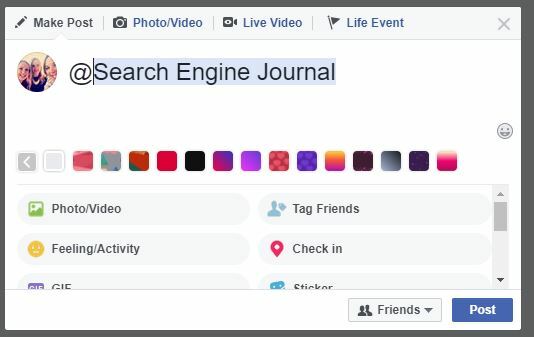 Screenshots taken by Natalie Hoben, February 2018.
searchenginejournal taken by Admin websparrows, February 2018.